Many young undocumented immigrants may be able to gain temporary relief from deportation under the deferred action policy recently announced by the Obama administration. 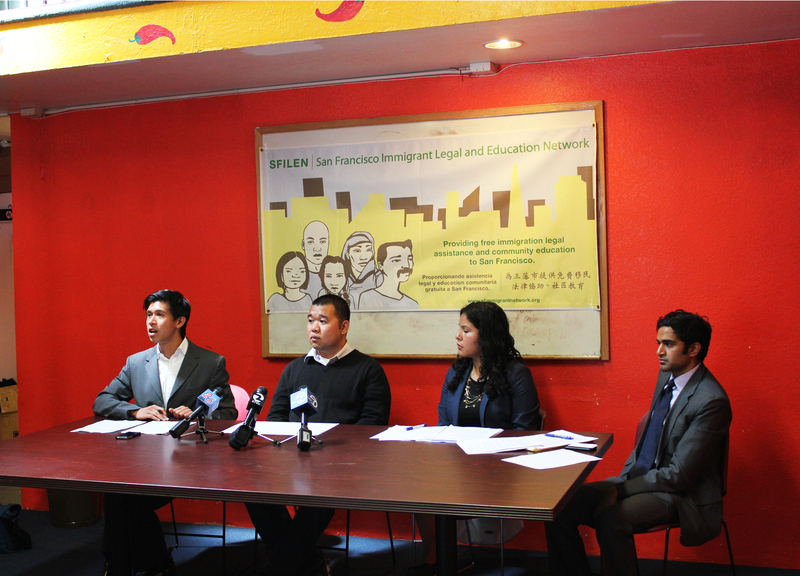 But the announcement left those who may be eligible with many questions and concerns, which prompted immigration attorneys from the San Francisco Immigrant Legal and Education Network (SFILEN) to hold a press conference with an undocumented community member at Dolores Street Community Services on Valencia Street on Wednesday. Christopher Punongbayan, deputy director of the Asian Law Caucus, stressed that it is important to understand the deferred action policy because it could potentially affect a large group of undocumented immigrants. According to Punongbayan, the Migration Policy Institute estimates that 1.76 million youth in the United States could benefit from the policy; at least 4,500 undocumented youth in San Francisco would be eligible. Under the new policy, immigrants will not be granted permanent citizenship status but deportation will be deferred temporarily; during the deferment period, they will not be deemed to be living in the United States unlawfully and will be eligible to receive employment authorization, the SFILEN attorneys said. “There are very specific requirements to become eligible to be deferred and it is important to consult an immigration lawyer to clarify your status,” Anoop Prasad, a staff attorney from the Asian Law Caucus, told the audience of about 15 community members. Prasad mentioned some of the requirements: immigrants must be under the age of 31 as of June 15 of this year; must have come to the United States before the age of 16; must have lived continuously in the United States since June 15, 2007; and must have been physically present in the United States on June 15, 2012. Applicants must also be in school or have graduated from high school, obtained a GED, or been honorably discharged from the army or the Coast Guard at the time they request deferred action with U.S. Citizenship and Immigration Service. Those with felony or serious misdemeanor convictions are not eligible. People who have traveled outside the United States for brief periods of time can still apply, Prasad said. For those who are worried about privacy issues and protecting the identities of other undocumented immigrants they know or live with, Prasad said the information in the deferral application will be used only for application purposes. “There are primary protections in place to protect the applicant’s identity and application information, [but] there is still no guarantee,” said Prasad. The application forms will be available starting Aug. 15, said Lorena Melgarejo, the director of civic engagement at the Central American Resource Center (CARECEN). Applicants will be charged a $465 fee, Melgarejo said. Although there is no fee waiver option at this time, an exemption may be granted under some circumstances — for example, for minors under foster care. “Applicants will need to start saving their money because it is a significant fee,” Melgarejo said. Melgarejo advised potential applicants to save any documents that can help prove their residency over the last five years — forms that include their name and the date — from school report cards to bank statements. There is no appeals process for applicants, Melgarejo said. She recommended that potential applicants consult legitimate immigration attorneys and nonprofit groups. Despite the complicated process and need for extensive documentation, the deferral policy provides hope and relief for undocumented immigrants like Emmanuel Valenciano, a 24-year-old member of the group Asian Students Promoting Immigrant Rights through Immigration. Valenciano, a biology major who attends San Francisco State University, came to the United States from the Philippines at age 13. He remembers the day President Obama announced the deferred action policy. “I was coming home from school that day with a friend and my mom called me and she told me, and I didn’t believe her; I thought it was one of her old rantings again,” he laughed. For students like Valenciano, the new policy has a special meaning. “What deferred action means to me is that I can now help pay for my tuition so my parents aren’t scrambling to just pay for next semester’s tuition. Having a work permit means that I can find a part-time job. Join your local TEA PARTY who are infiltrating the Republicans in the House and Senate. Change America with the TEA PARTY “THE PEOPLE’S revolutionary Constitutional party. One by one THE TEA PARTY will replace the political hacks—the liars, cheats and frauds in Washington that have been destroying America—and we will continue to do so with your help of the voters in this Republic. Learn more at teaparty dot org and judge for yourself. Millions of average Americans are joining to stop the rampant corruption in both parties. Join the TEA PARTY and battle with the people on all issues, including illegal immigration. Bring commonsense to our nation on restrictions by Obama on drilling for oil, taxes, the Legal Workforce Act and the Birthright Citizenship Bill. Dave Francis you fail at life.